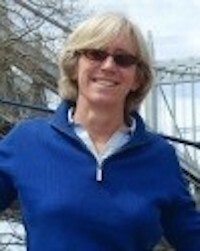 Leslie Andrews is the Director of Golf at Nehoiden Golf Club at Wellesley College. Prior to Nehoiden, Leslie served as Director of Instruction at Randall’s Island Golf Center, in New York City, the busiest driving range in the United States where she oversaw all instruction and programming. She is also the Founder and President of Leslie Andrews Golf, a golf services company, and GolfingWomen, a company dedicated to teaching women to play golf and use golf for business. Leslie is the author of Even Par: How Golf Helps Women Gain the Upper Hand in Business, a critically acclaimed first book which quickly established itself as the go-to resource for helping women get “on course” for business. Leslie has been hired by organizations such as Harvard Business School, Goldman Sachs, Barclays, Financial Women’s Association, The Wharton School, 85 Broads, and others, to help them encourage their women executives to utilize this invaluable tool. Leslie grew up in New England and graduated from Wellesley in 1982. A three-sport athlete in college, Leslie soon found a way to combine a love of sports with a successful career in marketing. She received her MBA from the Tuck School of Business at Dartmouth. After business school, Leslie was a senior executive with ESPN, first as a Vice President, Integrated Marketing where she spearheaded ESPN’s foray into owned and operated properties, and then as head of marketing at ESPN.com. In 2002, Leslie shifted gears and trained to become a golf teaching professional—she is now a Class A LPGA Teaching Professional – no small task for someone who took up golf at the age of 30. She co-founded GolfingWomen. In 2009, she was recruited by the LPGA to serve as the Executive Director of the LPGA Teaching and Club Professionals to develop a new strategic vision and plan for the LPGA teaching division. Leslie is a sought-after speaker, whose speaking engagements have included the Barclays Women’s Leadership Expo, Boston Golf Expo, Harvard Business School Women’s Leadership Conference, Credit Suisse Women’s Network, EWGA National Conference, and Columbia Business School Leadership Conference.